The “Reflex” Pick & Place! 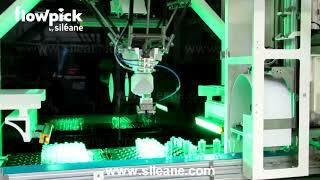 The Flowpick robotic machines from Siléane manage random flows, and loose, fresh or fragile products. They are able to sort, calibrate, handle, and pack all types of product with unpredictable behaviour at high speed, especially as a result of the VRT (Vision, Robotics, Tracking) technology. Powerful software for balancing and flow supervision manages multi-robot configurations. Essentially, the FLOWPICK VRT hub makes it possible, in real time and in a closed loop, to adapt robot trajectories to the vagaries of the product behaviour and flows with product speeds that are sometimes greater than 40 m/min. So these robotised lines created by Siléane adapt to all industries (agri-food, glassworks, pharmaceutical, recycling, automobile, etc.) and many products (fruit, chocolates, biscuits, cheese, bottles, food trays, sachets, etc. ), adhering to all your conditions and environmental restrictions (hygiene, humidity, temperature, pollution, etc.). 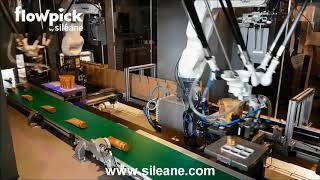 VISION REFLEX 3D® technology from Siléane and its decision algorithms make it possible not only for the robots to adapt their trajectories in real time, but above all, to simplify machine adjustments for the user in many cases and to reduce production changeover time greatly. This is where the sense of Siléane innovations lies: enabling the machines to develop themselves further using their experience and to adapt their settings automatically to make your life simpler, as well as those of your machine setters, and all users. The Flowpick range is already well known in the agri-food industry, Siléane’s historic market, and can adapt to all industries (agri-food, glassworks, pharmacy, recycling, automobile, etc.) and to many products. Flowpick deals with operations of picking, composition of fixed weight assortments, boxing, canning, loading and unloading of machines, sorting and control; all adapted to your production rates and for all your product types, even those with unpredictable behaviour. 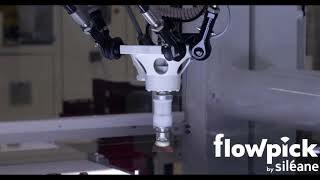 Turnkey delivery is possible for Flowpick. Siléane adapts it to your needs, your organisation, and your production flows, whether you are an SME or a large company. For more than 15 years, Flowpick has proved itself in terms of reliability and ROI. It breathes new life into your process and packaging lines. Traditional robotics does not usually like random environments, products with no defined shape and bulk products. Your production is then full of unusual parameters that are not easy to grasp. We have solutions! 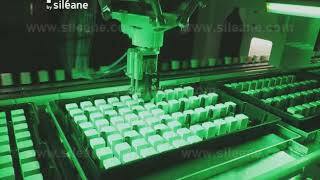 Siléane has many example of success: filling boxes of dates with a set weight, crates of bananas, trays of confectionery or pastries, making apple tarts with a set weight, calibrated and correctly covered, transforming a heterogeneous production flow into homogeneous sales units. Our solutions control and handle with great flexibility. Our solutions are able to manage fresh products or pre-packaged Doypacks®, flexible or rigid packaging, sachets, food trays, nets, regular slotted cartons, food trays with dividers, thermoformed boxes. They control your products and contents in flows to make up shipping batches. Boxing, Packaging Regular slotted cartons, Flatbed cutting, etc. “Traditional” robots reproduce pre-learned or programmed gestures. But how do you create (and not copy) a spontaneous gesture in real time and random context without learning? For cutting, decorating, and forming, the 3D gesture enables our robots to understand all the subtleties of a 3D space in real time and adapt their trajectories automatically. In short, they like the unexpected. I appreciate the Siléane team very much because it is able to meet industrial challenges and believe in a project, even if it is complex!